"Pan-fry Brussels sprouts in butter and crispy bacon for a smoky addition to your vegetable side dish. You can add a little of the bacon grease to the dish if you prefer." Cut an 'X' in the core end of each Brussels sprout. Set sprouts aside. Place bacon in a large skillet and cook over medium-high heat, turning occasionally, until evenly browned, about 10 minutes; drain and cool on paper towels. Crumble. Heat 1 teaspoon butter and olive oil in a large skillet over medium heat; cook and stir garlic until golden brown, 3 to 5 minutes. Add Brussels sprouts; toss to coat. Stir in broth, salt, and black pepper; cover and cook until Brussels sprouts are tender, 12 to 14 minutes. Drain liquid from pan. Stir remaining 2 teaspoons butter into Brussels sprouts mixture until melted. Mix in bacon and serve. 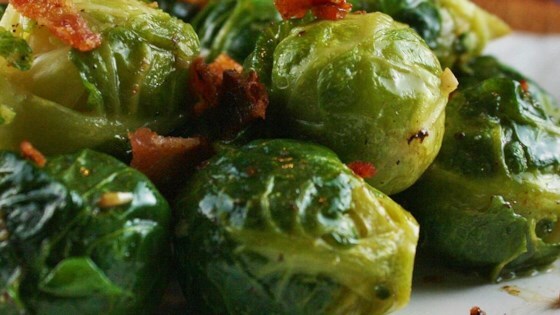 Vegetable of choice (in this case Brussels sprouts) + bacon + garlic = you can’t go wrong.